DIVATOR MASK. The DIVATOR HATCH is attached to the side of the DIVATOR MASK not interfering with the field of vision and gives the diver ambient air while on stand-by or at surface level. The DIVATOR HATCH is designed with Interspiro's safety innovation pedigree. The Hatch is easy to operate: pull to open and push to close. The DIVATOR HATCH has a small form factor and will not hamper the diver above or under water. 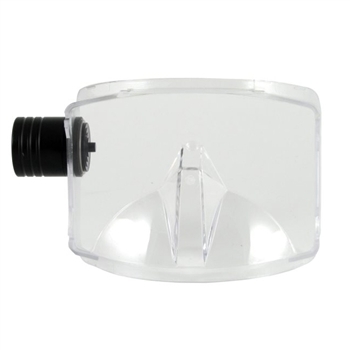 The design of the breathing valve keeps the breathing resistance extremely low. Ambient breathing will not only increase cylinder duration time but will enable the diver to keep the face mask donned while on stand-by. DIVATOR HATCH is a perfect complement to the Divator full face mask for professional divers.